Projects Abroad Sri Lanka’s High School Special Medicine volunteers collaborated on a project to send wishes of hope, health and good fortune to new mothers and babies. 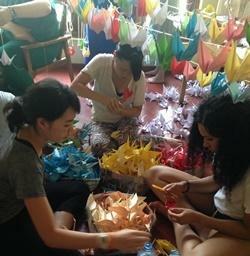 Inspired by Japanese tradition, 13 High School Special volunteers crafted 1000 paper cranes to decorate the wards at the Kethumathi Hospital for Women in Panadura, a town in the Kalutara district in Sri Lanka’s Western Province, some 25 kilometers south of Colombo. “In Japan, cranes have great symbolism,” shared Moeno Inukai, a 16-year-old volunteer from Kawasaki. “The gift of a crane is one that can mean many things, from good luck to recovery from illness. This health and auspiciousness becomes eternal when 1000 cranes are given,” said Moeno, “though I never imagined we would make so many as a group”. Moeno’s wishes for the hospital’s newborns started on a small scale, but through collaboration with the international volunteers at Kethumathi Hospital they turned into something larger. With Kaitlin’s guidance, Moeno imparted her skills in this traditional Japanese art to her fellow volunteers, and eventually with many of the patients and staff at Kethumathi. “I encourage all volunteers to share their culture with one another, but Moeno and I saw great potential in the 1000 crane project. Here was an opportunity to brighten the wards at the hospital, provide a message of hope and inspiration to the hospital’s patients, and teach Sri Lankans about Japanese culture,” stated Kaitlin. What became a project that involved Moeno’s fellow four-week volunteers eventually saw the assistance of a group of two-week volunteers, also assisting at Kethumathi. “I did not know how long it might take us to make 1000 cranes,” said Moeno, “but once so many hands were helping, we finished the project in one week”. In much of Asia, cranes are symbols of longevity and good fortune. Cranes are not native to Sri Lanka, but this allowed volunteers a further opportunity to explain the birds and their significance. As soon as all 13 Projects Abroad volunteers at Kethumathi Hospital spent their free time crafting the paper cranes, there were quickly well over 1000. “The volunteers worked hard to string 1000 in the postnatal ward. They also crafted eight mobiles for the neonatal intensive care unit, in addition to giving origami cranes to new mothers,” stated Kaitlin. 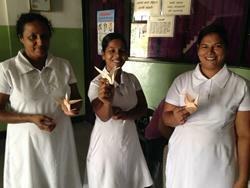 The nurses at Kethumathi took great interest in learning origami as well, and the volunteers were able to teach the hospital staff of their symbolism. “Projects Abroad has worked with hospitals in Panadura for ten years, including the Kethumathi Hospital for Women,” shared Gishan Perera, country director for Projects Abroad Sri Lanka. “This summer marks the first that we have invited high school volunteers to Kethumathi, and a larger group has meant greater opportunity for observation, patient interaction, and beautification of the hospital’s wards,” he said. “Above all, the 1000 cranes project shows that sharing one’s culture, and developing a relationship with patients through service, can lead to something greater,” stated Kaitlin. Moeno came to Sri Lanka with an eagerness to communicate her traditions through volunteer work. The beautiful result of her enthusiasm and optimism now hangs as a symbol of hope, a wish for good health, and a sign of teamwork between Sri Lanka and the many young faces of Projects Abroad volunteers.